Today's #TuesdayTeaser is from an upcoming book, due to release in late January. Collin cursed, wind pulling at his hair, his thighs tightly gripping the flanks of his reliable gray, the horse’s hooves pounding like thunder into lush Kentucky bluegrass. His arms strained against the fabric of his lightweight jacket, held close to his body. A strong hand firmly clutched the horse’s reins, keeping total control over the animal. Keen eyes watched as the coyote slipped into the briars ahead and disappeared. His foxhounds followed but the animal wouldn’t linger. This one was crafty. There was no way that coyote would stay put. The animal intended to lead his dogs astray even if it killed him in the process. Years ago a coyote was unheard of in Kentucky but with their recent eastward migration, they were now quite common, and a crafty one would lead a pack of hounds deep into the river cliffs never to be seen again. Collin knew that. The hounds were bred to chase, and if a fox wasn’t readily available, they took after the next best thing. Today, on what he thought was a leisurely jaunt on a spring afternoon to exercise his horse and his hounds, he was not in the mood for it. He’d be damned if that mangy cur would lead his prized hounds into the river. The dogs slowed, then howled and pawed at the ground around the thicket, hungry for their prey. Collin brought his prancing mount to the pack, calling them off their quarry—then suddenly, following a flash of dirty gray, they were off again. They moved as one, Collin and the stallion, a huge mass of raw sexuality and power, each sensing the other’s thoughts, movements, and intentions. The huge beast raced toward the pack, the wily coyote leading his hounds further away. Collin knew he had to call them off soon, had to get their attention before the animal took them where he and his horse couldn’t go. Perspiration beaded his forehead then dried in the wind. His muscles ached with the thrill and tension of the chase, although this chase was not welcome. A normal romp with a fox and his hounds was what he lived for, what he loved. And even though he knew both his horse and his hounds were at risk, plunging at breakneck speed across his farm, he relished in the chase. As usual, when riding and keeping his hounds to the fox, his body grew tight with exhilaration, his mind sharp with concentration. Every sense heightened. Every nerve stood on high alert. Adrenaline coursed his body, spurring him on. He concentrated on the pack before him as blood pounded through his veins, surging through every capillary and artery. Heat rose to the surface of his skin. The experience was one of dominance and power. The hounds yipped and barked as they chased their quarry, hot on the scent of the animal. They raced hard against the wind roiling out of the gray afternoon sky in the west. A spring thunderstorm threatened. Collin narrowed his gaze as the coyote leapt the rock fence bordering the edge of his farm, and silently swore. The dogs hesitated, jumping and clawing at the wall, and then scrambled over. Damn it! Without thinking, and in one swift movement, he guided the stallion up and over the fence. Collin saw nothing but the pack of hounds in front of him, the lead dog straight on course with the coyote. He was hell-bent for leather on seeing this thing to the end. He’d seen other hunters give up on the dogs, hoping they would come home eventually. Not him. Nothing would stop him. The tireless hounds raced on, oblivious to their surroundings, the horse closing in fast. The coyote, now on open ground, ran for his life. Collin would never kill the animal, but the coyote didn’t know that. He could almost sense his fear. He imagined the trembling in his stomach, the panic shaking his legs, the hounds breathing hot down his neck. He urged the horse on. Hooves churned the soft Kentucky soil as they jumped another fence and galloped onward. Collin vaguely noticed a building to the right. He ran onto different terrain, shorter grass, smooth ground, gravel—but his eyes never left the coyote. Thunder cracked in the distance. A flash of lightning splintered the air. An ear-splitting scream pierced the buzz around him and everything came to a sudden and abrupt halt. A contradictory feeling of silent slow motion and mass confusion sped over him as the hounds ran circles in agitation. The horse sidestepped excitedly, then another scream and a feminine slew of curses penetrated the unnatural silence. The coyote scurried off to safety. “What the…” The past few minutes his mind had comprehended only one thing—the chase. Now, he diverted his attention to the ranting and raving female standing before him. Rake in one hand, hoe in another, she shouted incomprehensibly, flailing her arms. His inspection of her started from her dirt-clodded work boots, then slowly traveled north to her muddy blue-jean clad knees, and upward to a man’s ragged chambray work shirt tied at the curve of her small waist. His perusal followed up the front closure of her shirt. Two button snaps at the top had popped open during her tirade revealing a wisp of white lace and the top of a fully rounded, lily-white breast. His gaze resumed its trek up a delicate, slender ivory neck to rest on an angry, but extremely beautiful face. Coal black eyes spat back at him, and her long inky ponytail held high on her head with a red bandanna, whipped with the breeze coming off the storm. He sucked in a breath. Was she speaking? Yelling. He heard that last piece very clearly. Collin remained solid in his seat, enjoying the dominant position—still smiling but glaring back at the delicate, yet willful woman. Spitfire of a little country thing. She turned, dropped the hoe, and picked up a clod of dirt at her feet. Her gaze shot back as if she’d heard his thought. Her eyes narrowed and she scrutinized him as he sat above her. Her gaze traveled from his breeches at her eye level, to his face. He stared back, a smile tugging at the corner of his lips. She fumbled with the clod of dirt, flexing and gripping. Then she did something Collin thought unthinkable. The dirt clod spun out of her hand like a second baseman hurling a ball toward first. The dog promptly yipped off behind his master when hit—and in the next instant, Collin leapt off his horse and exerted all the control he could muster not to grab the woman and shake the tar out of her. His fists clenched together tightly at his side. He felt the grin vanish from his face. “Don’t you ever...” he snarled. “Then get those damn mutts out of my garden,” she spat back, their noses inches apart. Collin felt the venom of her words, along with her heated breath against his face. Blood surged throughout his body, his breathing quickened. 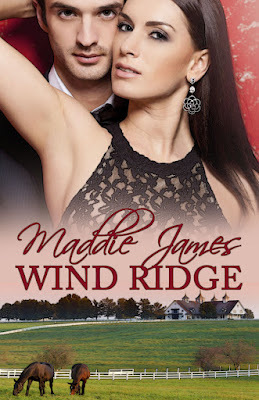 To read another excerpt from Wind Ridge, click here. Wind Ridge is scheduled to release in late January, 2016.